The game is based on action east of Ponyri station on July 8. The Germans have captured the former Soviet positions on 226.5 and are just about to be assaulted by the 3rd Tank Corps. As usual I never know exactly who is going to show up, so had several units ready to go at staggered intervals. The key was for the Soviets to get across the table and stymie any German reinforcements. Didn't happen. 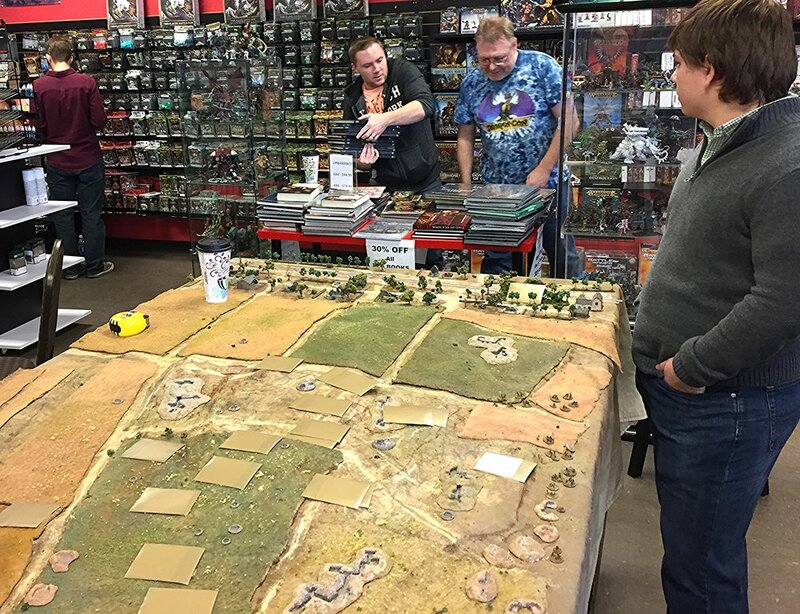 David (Gigabites owner) and Chris S discuss discounted RPG books while Jacob awaits the Soviet onslaught. The Railroad runs parallel to the edge. Germans are defending the hill (226.5) in the center of the table. They start with a weakened company of the 507 Grenadier Regiment from 292 Infantry Division: six veteran sections with four Big Men, two MMG sections, two 47mm French ATG and a +2 tank ace in there, one infantry gun, and another Big Man for the weapons, one panzerknacker section, and a FOO for 8cm mortars. This was Sean's first game of IABSM. Everything can be dug in and they can use the ex-red army entrenchments. Jacob (his first game too) had the armor which at the beginning was just two Marders coming in from the NE edge. They start with an infantry company (ten sections, three ATR teams and two MMG teams) from the 57th Motor Rifle Brigade (William CO'ed). They can be tank riders on the two weak companies of T34s from 51st Tank Brigade (Roger and Randy: their 1st IABSM game) with fifteen tanks. I gave Sean oodles of Blinds to put out to speed things up instead of using hidden units. This ATG managed to KO at least three tanks. The MMG gun next to him made William jump off the T34s and move by foot to the first ex-Soviet entrenchment. Sean opted to set up further back near the hill crest with his units. Randy's tanks are stopped in the center by the ATG, so he swings the rest to his left and moves around the ditches where he is halted for the rest of the game by the cards not showing up and the Ferdinands appearing. The full force of the tanks and infantry was concentrated on the two guns for a few turns. The two guns from Panzer Jaeger Abteilung 292 go hull down and start to blast the T34s. The first two Ferdinands (Chris) from sPz Rgt 656 make an appearance and immediately start hitting the T34s. I had thought that the T34s would be sweeping over the battle field heading to the NE by now, but Roger halted his company to silence the German infantry who were down to no ATGs and trying to hide in their trenches. This is one thing about a game that has an unknown enemy. Roger and Randy both assumed that there were more ATGs out there so were over cautious. Randy because his cards wouldn't come up! Yes the cards were definitely favoring the German reinforcements now. The first three Stugs IIIs from StuG Abt 244 (with tank ace Oberstleutenant Grosskreutz) are also heading to the southern edge of the table. Randy did get some KV1s from 27th Guards Tank Brigade on the table but they went to ground to try to snipe at the Marders. 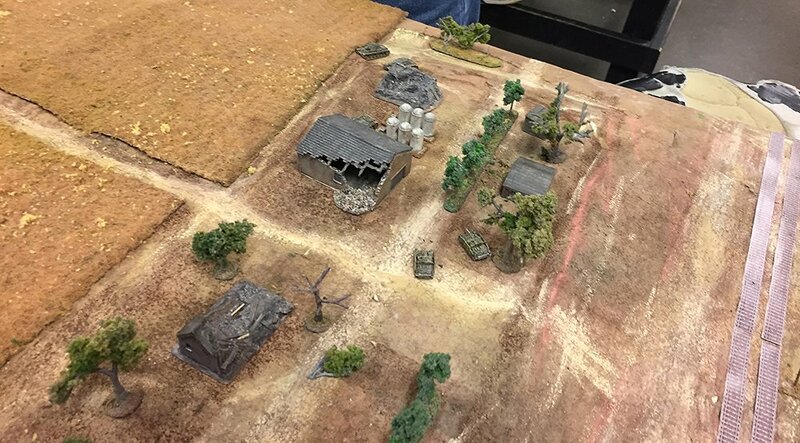 Jacob moved the StuGs down to the far edge of the table in search of Randy's KVs who were stalking the Marders. Randy had no luck with his cards in this game. The Germans were always able to get their card to come up before his. In retrospect the best strategy would've been to cruise on through and seize the German deployment area. Sean had one panzerknacker section left. The pair of StuH42s and Brummbars were also moving up to hammer the Soviet infantry. They were already down to one Big Man. Their Company CO was killed in a random strafing attack. 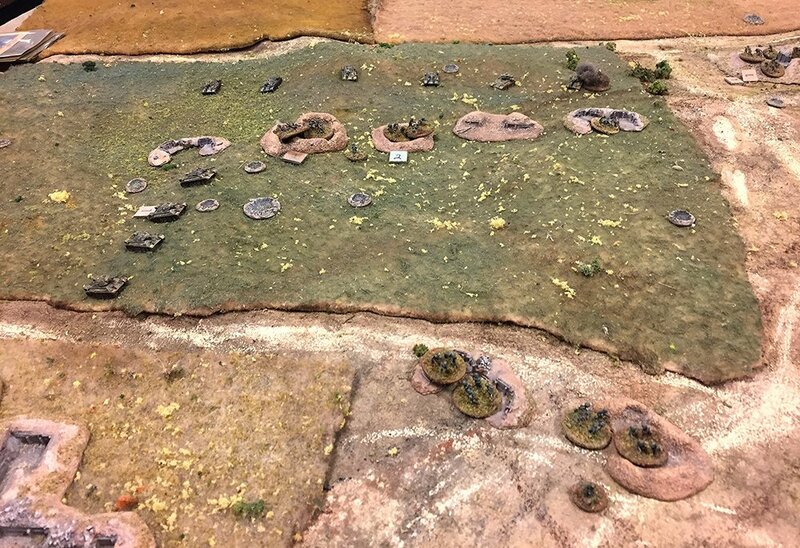 Meanwhile Rogers T34s were going to be on the losing end of a duel with the Ferdinands moving towards the center of the table. The Soviets lost their momentum and allowed the Germans to get their armor on the table.